NASHVILLE – The Tennessee Bureau of Investigation has put a Murfreesboro man on the state’s Top Ten Most Wanted list in an effort to take him into custody on murder charges. Forty-six-year-old Bounthavy Mickey Mouthouta also known as “Soviet”, whose last known address is 105 Riddick Court, Murfreesboro, is wanted by the Smyrna Police Department and TBI for one count of first degree murder and one count of attempted first degree murder. On June 23, 2013 at approximately 1:30 a.m., a shooting occurred in at the Souksavahn Restaurant located at 1890 Almaville Road that left three people shot. One of the victims, John Bouavong, died as a result of the shooting. 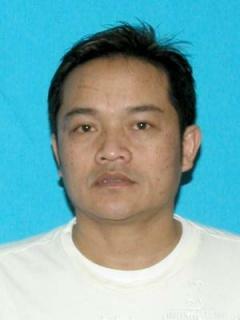 Mouthouta is described as an Asian male with black hair, brown eyes and could be driving a 2004 Silver Honda Accord with Tennessee tag 093NGR. He is 5’5,” weighs approximately 140 pounds. He has previously been arrested on drug charges and may be armed with the 40 caliber pistol used in the shooting. Anyone with information on the whereabouts of Bounthavy “Mickey” Mouthouta is urged to call the TBI at 1-800-TBI-FIND (1-800-824-3463) or the Smyrna Police Department at 615-267-5434. There is a $1,000 reward for information leading to his arrest.